Collies come in both the more common rough-hair and less common smooth-hair varieties. 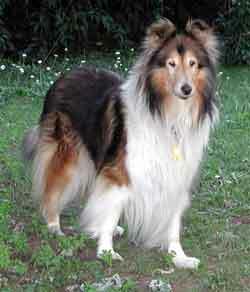 The rough collie has coarse, straight and abundant outer coat with short, smooth hair on the head and legs. The smooth collie has smooth short hair everywhere. They come in four distinct colors which are the same on both types. Sable and white is the most recognizable because of the "Lassie" series. The sable color on these dogs can range from blonde to a deep reddish-brown color. Tri-Color dogs are mostly black and white with sable markings. Blue Merle collies are black and white with mottled gray-blue markings. White collies are mostly white on the body with colored heads. Originally bred in the Scotch Highlands as a working stock dog they were originally called "Scotch Sheepdogs". They are renowned for their loyalty, reliability and ease of training. The Collie is a great family companion, watchdog and friend. Every kid should have one! Male collies are from 24 to 26 inches at the withers and weigh from 60 to 75 pounds. The smaller females are from 22 to 24 inches at the withers and weigh from 50 to 65 pounds.